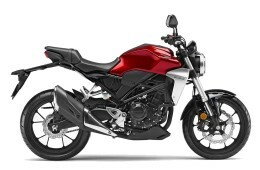 In terms of engine and technology the CB300R is completely modern with the latest in the series, single cylinder 286cc thumper originally introduced with the CBR250R (note the single R) introduced in 2011. This engine has proven reliable but has no tech bragging rights by virtue of having only one cylinder compared to the 250c twin in the CB250 or the older road racer 4 cylinder CBR250RR on the 1990s. Other ‘features’ include twin disc brakes, ABS, USD forks, LED lights and digital instrument panel which is pretty class standard. Now you may think that the Honda CB125 is the real successor to the CB250 but the main reason why the CB300R is the the real replacement, is that it represents the standard spec motorcycle you would expect in 2019 and beyond! I think anyone considering buying their first motorbike will gravitate to the modern CB300R rather than the old tech CB125, which I consider a ‘beater’ motorbike. Sure the CB300R RRP is just under $7000 AUD, consider that it’s one of the most powerful LAMS or learner bikes and combined with less weight means more usable performance than the heavier fully faired motorcycles. There are plenty of deals in the LAMS model range too so you are sure to get a better on road deal! For example the CB300R can be purchased as a Demo for around $5500!